High quality film photography has a certain feel to it that I have always loved. Film captures light differently than a digital camera, and you have to be more purposeful with your images. When I started looking into learning film photography, I think the thing that appealed to me most was slowing down. Sometimes I feel like I am going 90 to nothing when I am taking pictures. I wanted to take a breath and really focus on what I am doing with light, composition and posing. When shooting film, you’re limited by the number of exposures you have per roll, so you don’t want to just click away like you would with a digital camera. My goal is to be more intentional with each photo, and I hope learning film helps to make me a better photographer. When it comes to sessions, I will still be shooting digital images. If I do incorporate film into my session work it won’t be for a while, and then I think I would like to be a hybrid photographer versus one or the other. I do love the look of film, but I love having all of the digital images at my fingertips after a session or wedding. I recently purchased a 35mm Nikon camera. It works with all of my lenses, and I am so excited to learn. When I first got it, I thought I would just use my DSLR to get the settings for my SLR, but oh man was I wrong! Film does not react to light the same way that digital does, and the ISO setting is based on the type of film you use. Another thing I learned was the type of film you use sets the whole tone for your images, much light an editing style for digital images. I practiced with Kali and Jon’s greenhouse session before really knowing what I was doing. So after going through that, I signed up for an online class taught by Julie Paisley and it has been an eye opener! She gives you different assignments, and the first was to shoot a roll of drug store film at certain settings. The main idea was just to shoot that first roll of film. I have sent two rolls off to be scanned in, so I can’t wait to see how they turn out. Fingers crossed that I actually want to share them with you guys! How do you feel about film photography!? What questions do you have for me about it? Want to connect? 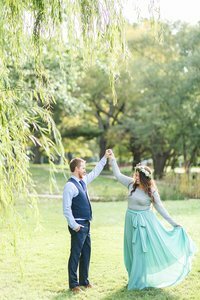 Sign up for the KA newsletter for updates about wedding planning and how to prepare for your session!